Have I told you about Legends and Lore lately? Aside from my having a story in it (“Natural Order”), it’s a great anthology. Wait, that didn’t come out right. Let’s try again. It’s a great anthology that happens to have a story of mine in it, “Natural Order”. Nine fantastic tales inspired by a variety of mythologies and mythological beings, Legends and Lore takes reality as we know it and tweaks things a little, in nine different ways. This isn’t a review, so I’m not going to gush about any particular (or every!) story other than to see it’s a great read. There’s a lot of good storytelling in these pages. As an ebook, it’s currently available on Amazon, with the print version just slightly delayed at the moment due to a formatting issue, but I can’t wait to get my hands on it. So, Legends and Lore officially releases on Wednesday, although the e-version is already available on Amazon. I’m excited about this anthology in a way I’m not sure I have been before, and I think it’s mainly due to the Release Party on Facebook. This happens on Wednesday, and while full details are on the FB page (games, prizes, questions and answers), I’d like to point out that it runs from 7-1130 pm Eastern Time, with each half hour belonging to a different author in the anthology. I’ve drawn the second half hour, which means my time is 730-8 Eastern, and fairly early in the game, but I’m going to stay for as much of the party as I can. This is a book with nine great stories in it (if I’m allowed to include mine in the count), and the group of writers involved have worked very hard to bring some great fiction. Drop by, hang out, ask something. Above all, have fun. And I’ll add in that today’s stop on the official Blog Tour, on Inspired Writers, features a short interview with me, which is neat but still a little odd. We’ll call this announcement number two, but I think I’ve spoiled it long before now. 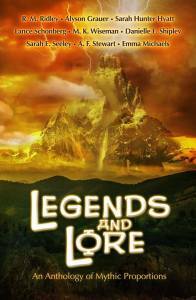 Legends and Lore releases on October 22nd just in time for all that Halloween gift giving you’ve got in mind. No, it isn’t a horror anthology. Very much fantasy, and very much worth the read if you’re a fan of the genre. My story, “Natural Order”, could, I suppose, be classed as Urban, Modern, or Legendary Fantasy, or all three, if you like. It clocks in at 7,247 words and misses being the shortest story in the book by 15. Yes, this is fantasy you can sink your teeth into. Depth, drama, danger, devotion, and other exciting words that start with other letters of the alphabet. I won’t spoil any of them, even mine, but you’ll probably get some tidbits of each if you come to the release party on Facebook on October 22nd. Yup, the same day the book actually releases. I’ll post details on that as they’re released.